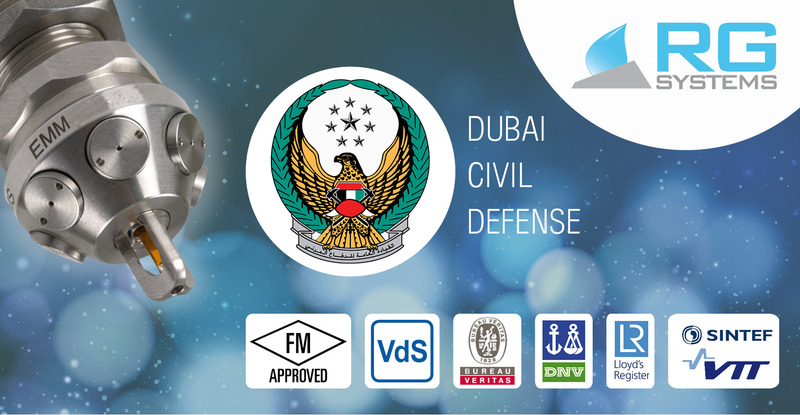 Water Mist systems from RG SYSTEMS have been approved by Dubai Civil Defense (DCD) organism in order to be distributed in United Arab Emirates market. To achieve this certification, a foreign company shall demonstrate high quality standards that exceed those of local companies. Thanks to RG Systems’ quality commitment with manufacture and design of all its products, RG W-FOG Water Mist systems add Dubai Civil Defense approval to its long list of prestigious certifications such as FM, VdS, Bureau Veritas, DNV, Lloyd's Register, SINTEF and VTT. RG W-FOG products include cylinder batteries, electric and diesel pump-sets, offering a full range of solutions for each hazard and suiting all needs with maximum performance.